We invested in a solar company, our country, that was a disaster. They lost plenty of money on that one. I’m a great believer in all forms of energy, but we’re putting a lot of people out of work. Energy policies are a disaster. We're gonna put the miners back to work, we're gonna put the miners back to work. We're gonna get those mines open. Well, I'm not a big believer in man-made climate change. It could be some impact, but I don't believe it's a devastating impact. Obama thinks the single biggest threat in the world today is global warming. Can you believe it? We want beautiful air to breathe, we want safety. Other than that — that's all we want. The rest we want are our companies to go out and compete with the world, they can't compete because of all these restrictions. It'll get cooler, it'll get warmer — it's called weather. Stop all payments of the United States tax dollars to UN global warming programs. The Environmental Protection — what they do is a disgrace. Every week they come out with new regulations. We'll be fine with the environment, we can live a little bit, but you can't destroy businesses. [...] and I believe strongly in clean water and clean air, but I don't believe in what they say, I think it's a big scam for a lot of people to make a lot of money. A lot of it it's a hoax, it's a hoax. In addition to pictures and text, in some cases the articles related to Donald Trump also contained videos about him and his position on climate change. All the scenes showing Trump talking about climate change were collected in a video collage, shown at the top of this page. 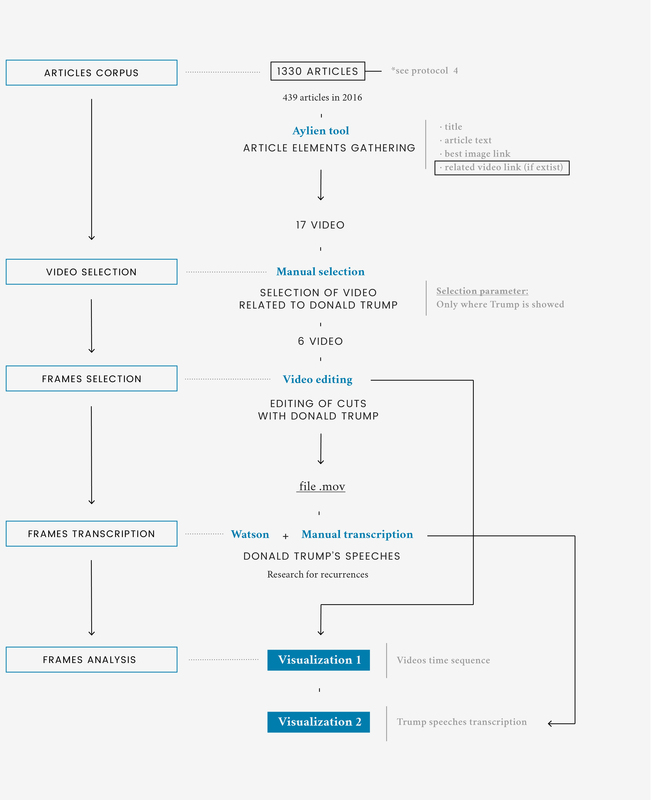 Under the video, a visualization shows, for each analyzed element, the temporal relationship between the scenes where Trump speaks or simply appears and the scenes in which he is absent. Alongside this display a text shows what Trump said in the video-collage. In order to better understand what aspects of climate change are effectively relevant according to Trump, the main words and expressions of his speeches are highlighted and divided into categories. The visualization shows that the speaking is mostly about personal opinions. Donald Trump is a climate change denial so he often claims his point of view about the topic. The rest of the words is mostly about work and economy, since one of the main point of Trump's presidential campaign is to restore fossil fuel energy in order to create new jobs. The issues of work and industries were also identified as emerging during the investigation around the images shown by the providers. Aylien tool helped extracting the links to the videos found within the articles corpus (question 4). Among the videos, only the ones in which Trump was shown speaking directly at least one time were chosen. The aim was to analyze how Trump communicates through an analysis of his speech as reported by the news providers. All Trump scenes were edited and put together in a single video so that Watson could extract all Trump’s sentences. The texts were then manually reviewed in order to correct any inaccuracies related to the tool and some keywords were extracted and tagged, according to their meaning within the context. The first dataset is the collection of the analyzed videos, with a series of important keywords extrapolated in the first superficial analysis. The second dataset is the collection of Trump's quotes: each keyword is separated in one of the five categories visualized at the top of the page.